New cat owner or baffled by feline behaviour? Take a look at our help and advice guides. Not all cats like to snuggle up on a bed at night. There are many cats who prefer to live outdoors, in farm buildings, or suitable shelters in gardens. At the National Cat Adoption Centre, we have a number of cats looking for a perfect outside space to make their home. These cats come into our care for various reasons and have varied reasons for wanting an outside home. Typically, cats looking for outdoor homes can wait a very long time to get the chance that they are looking for - and we think that should change. For peace of mind, every cat is microchipped, neutered,vaccinated and treated for fleas and worms before leaving our Centre. - 01825 741330 or cattery.reception@cats.org.uk. We have had great success with the outdoor cats that we have been rehomed from the NCAC. Most outdoor cats go to stables, farms or small holdings where the owners are looking for rodent control and this is the main reason they come to us. However we do find some different outdoor homes from time to time such as Belle’s home. Belle was brought in because of her unpredictable behaviour and, although a friendly lady who liked human company, she had a tendency to bite people. This made her a perfect candidate for an outdoor home. 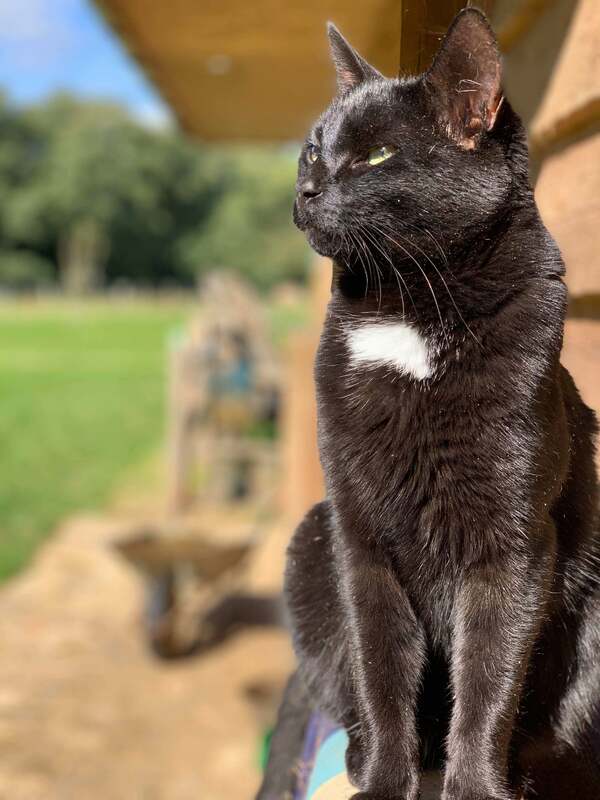 We have experience of cats like Belle doing really well in outdoor environments where they are able to express their natural behaviours and interact with people as and when it suits them. People’s expectations of the cat are less if the cat doesn’t actually live in their house or start off living in the house at least. Belle had been with us nine months before she was adopted. Her new owner has a cat allergy so came to us looking for a cat that would live outside. Belle has her own secure and dry outbuilding in two acres of land where the owners live, as well as a choice of a couple of other outbuildings to explore or hang out in. She is allowed to venture into the house, which she does from time to time, especially in the summer when all the doors are open. She just isn’t allowed to sleep in the house or be shut inside for any periods of time or overnight. We are sure that Belle is too busy helping to keep the mouse population under control to even notice. Tiger came to us as his owner had gone into care. Tiger had lived with his male owner his whole life so found the cattery environment pretty daunting, which was affecting his behaviour. We felt Tiger would benefit from a home where he could start off outside in a secure outbuilding where he would feel that he had no confinements or restrictions. It would then be Tiger’s choice if he decided to venture into the home or not. It was over the winter that Tiger found his new home and pretty much moved straight into the house when he came out of his outbuilding. His new owners fell in love with him instantly and loved his independent attitude. “He’s definitely a man’s cat…..with a seat by the fire. He ventures outside but not really been for a proper explore yet, maybe when it’s warmer and drier.” Tiger has certainly got his paws firmly under the table so to speak and has really benefited from being able to make his own choices with this type of home set up. Daniella came to us as a stray with her kittens so little was known about her background but she was quite fearful of people. Once her kittens went home we felt it would be beneficial for Daniella to live outside where there were few people. Daniella went to live at a private stable where she had the hay barn all to herself with only the owner and occasionally her grandchildren around. She has formed a fantastic bond with her owner and loves to spend time having lots of strokes and getting on her lap. “She is catching mice as if they are going out of fashion, and even venturing into the stables when the horses are in.” This type of home worked so well for Daniella as no expectations were demanded of her and she was able to decide for herself if and when she wanted attention from people. Additionally the stable now has efficient and natural rodent control. "Tabitha is still an outdoor cat and loves it but she visits us indoors. She has settled so well and we love her dearly." "Timmy is the king of the barn, and I am absolutely convinced that he is in cat heaven." "Jake is now outside and no longer the loneliest cat, he really enjoys running around and having a fuss." Why Should You Get Your Cat Neutered? Are you killing your cat with kindness?